When you think of muscle, skeletal muscle, which helps you move, might be what first comes to mind. But other types of muscle tissue, such as cardiac and smooth muscle, also play an essential role in keeping your body properly functioning. These two types of muscle have many similarities, but cardiac and smooth muscle also have differences worth noting, particularly with regard to their appearance, location, innervation and actions. Anatomists generally describe muscle types based on their nervous control, appearance and location. Thus, you would describe a muscle you willfully control as voluntary and muscles that automatically contract are involuntary. Based on whether they appear striped or unstriped under a microscope, muscle fibers are also referred to as striated, meaning striped or smooth. Cardiac muscle is striated. Smooth muscle, like skeletal muscle, is found throughout the body. In addition to their striated appearance, cardiac muscle fibers differ from smooth muscle in that they contain multiple nuclei and behave like single units. Both types of muscle contain a centrally located nucleus. A unique feature of cardiac muscle cells or muscle fibers is that they split and link into a chain via intercalated disks. These disks allow communication between cells, enabling the sequential contraction of the myocardium. Thus, your brain does not have to send a signal to every cardiac muscle cell for your heart to contract and eject blood. 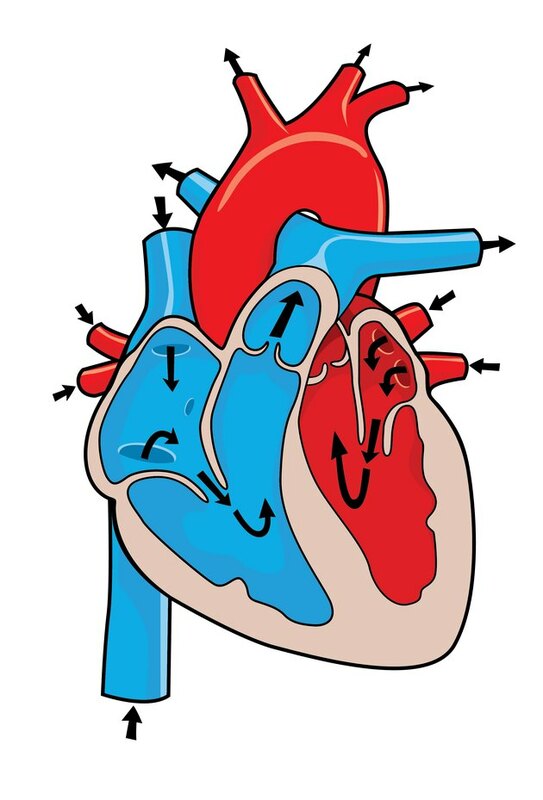 Cardiac muscle forms the myocardium, or muscular wall of the heart. The major blood vessels arising from your heart, such as the aorta, also contain some cardiac muscle. Smooth muscle, on the other hand, is a major component of the walls of all blood vessels. Additionally, smooth muscle is predominant in the ducts, tubes and cavities of your digestive, urinary, respiratory and genital systems. Smooth muscle is also found in the skin and eyeball. Smooth muscle and cardiac muscle are both involuntary muscles. Specialized cardiac muscle fibers make up the pacemaker that regulates your heart rate. This pacemaker, in turn, is under the control of the autonomic nervous system, the part of the nervous system that operates below your level of consciousness. Smooth muscle differs in that the autonomic nervous system directly innervates it. Other triggers that can cause smooth muscle to contract include hormonal stimulation and stretching. Cardiac and smooth muscle can both generate force to move or hold back the contents of the body cavities they surround. Cardiac muscle essentially pumps blood, and smooth muscle is responsible for the rhythmic contractions that move contents in your digestive tract, uterine tubes or ureters. In the eyeball, smooth muscle helps control the size of your pupil and thickness of your lens. Compared to cardiac muscle, it responds more slowly to signals from your autonomic nervous system. However, smooth muscle is able to contract for longer periods of time and can stretch more than cardiac muscle without suffering injury. The high activity of cardiac muscle requires an important blood supply. During a heart attack, cardiac muscle fibers lose their blood supply and become damaged. Unlike smooth muscle cells, cardiac muscle cells cannot be replaced once they degenerate. Also, whenever your heart has to work harder than usual, your cardiac muscle fibers increase in size. In contrast, increased demand on your smooth muscle cells causes them to increase in both size and number.